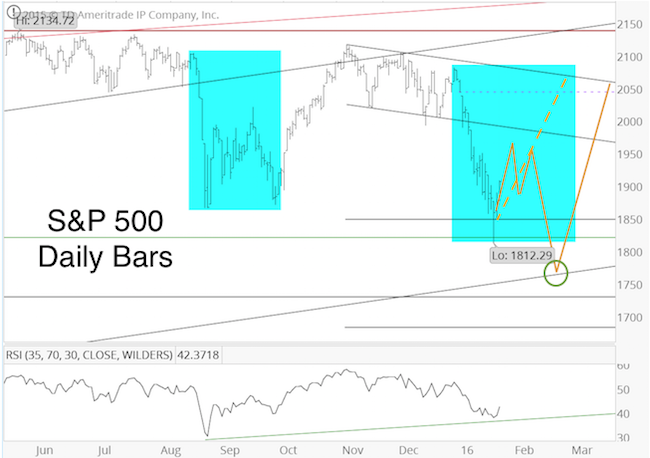 Thursday’s (Feb. 11) special Profit Radar Report update recommended to buy at S&P 1,828 and listed six reasons for a rally. Below is an excerpt from Thursday’s Profit Radar Report. “Forrest Gump would probably describe this market as a ‘box of chocolate.’ Let’s open the box and look what we’ve got. Obviously, momentum is to the down side. Betting against momentum is always a risky proposition. Having said that, there are a number or tell-tale signs hinting of a (temporary?) momentum shift. 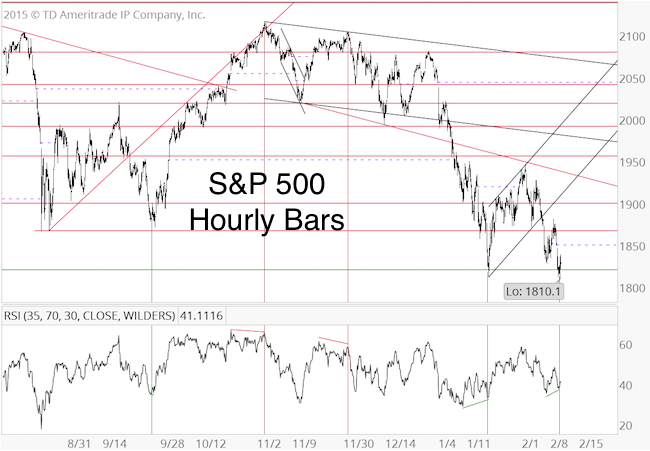 1) Today’s open left another chart gap (first and second S&P 500 chart, dashed purple lines). 2) There’s a bullish RSI divergence on the hourly chart (first chart). 3) There’s a bullish RSI divergence on the daily chart (second chart). 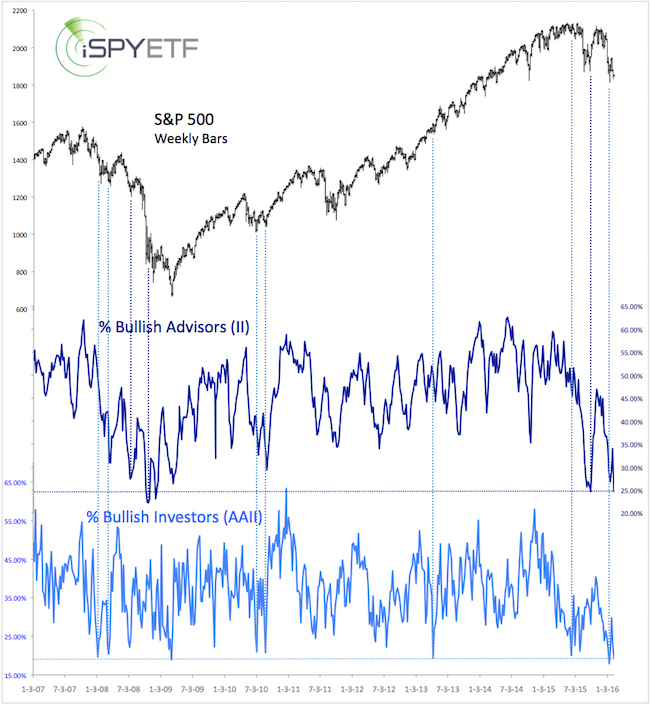 4) Some investor sentiment gauges are nearing pessimistic extremes (third chart). 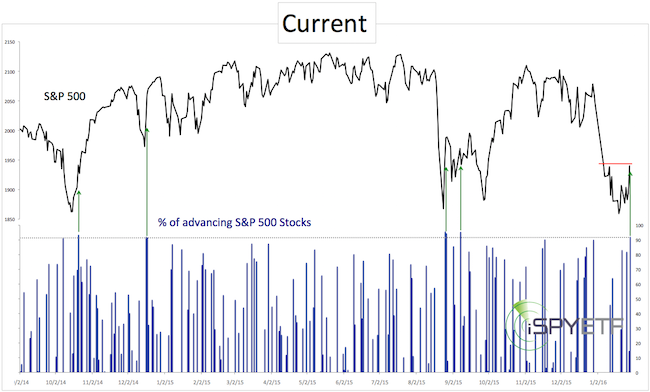 Longer-term sentiment readings (such as the II and AAII polls shown below) suggest a bullish bias for the coming months. 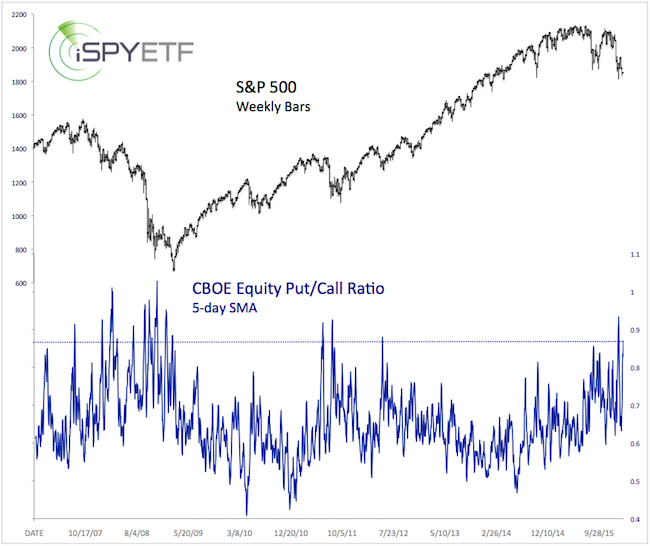 Short-term sentiment readings (such as the CBOE equity/put call ratio – fourth chart) are not yet in nosebleed territory and allow for further losses. 5) Today’s low could be the spring board for the updated projection shown in Wednesday’s PRR. 6) Based on correlations between asset classes, investors are piling into the ‘fear trade’ (buying gold and Treasuries when stocks are down). 30-year Treasury prices and gold are up more than 10% in recent weeks. 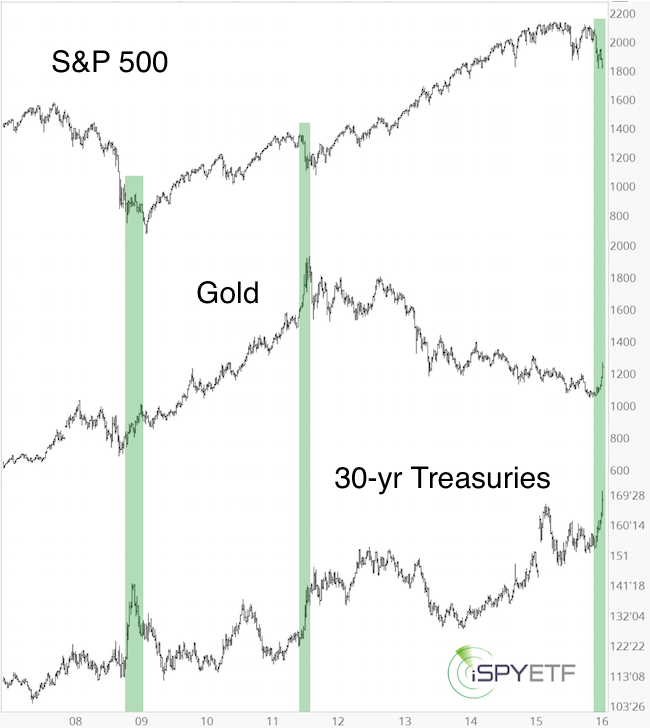 This combination (gold and Treasuries up more than 10% in a couple of weeks) has only occurred three other times since 1975 (according to SentimenTrader). 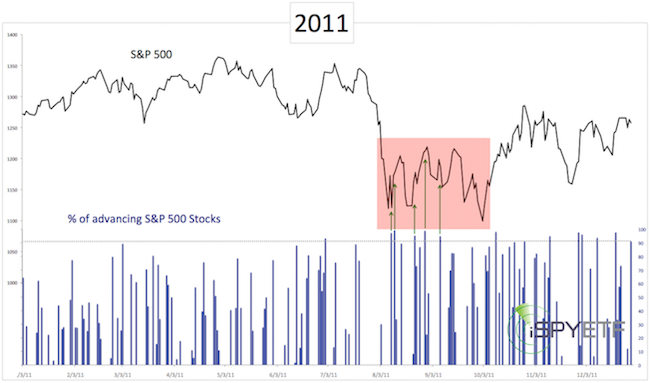 Chart #5 captures the November 2008 and August 2011 occurrences. 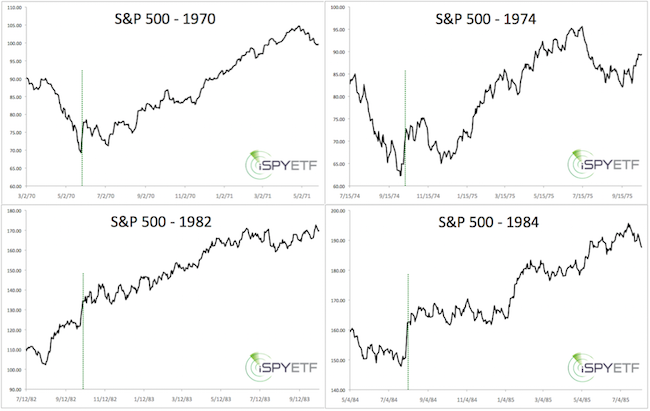 In 1982 (not shown), the S&P bottomed closely thereafter, and rallied 44% over the next year. 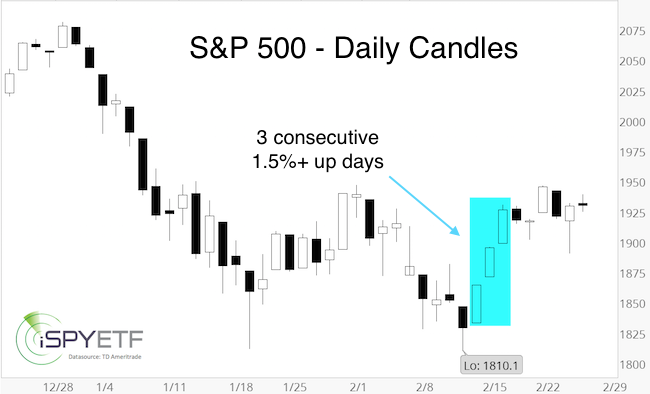 Although this rally may relapse eventually, Thursday’s dip provided a low-risk entry, to get some ‘skin in the game’ in case this turns into a runaway rally with higher than anticipated targets. 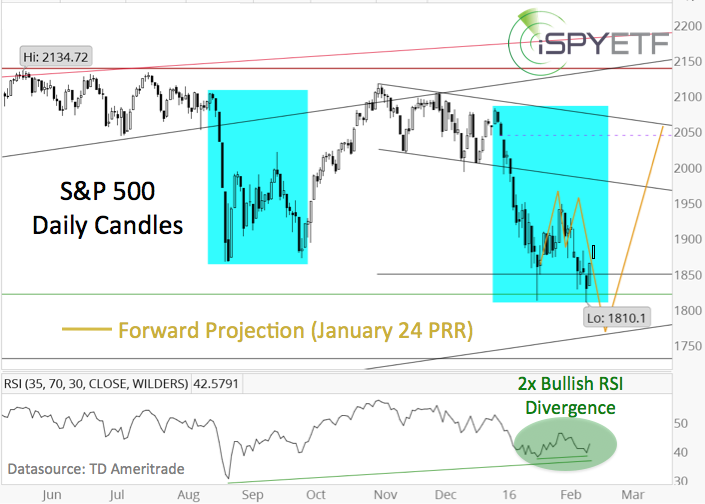 The S&P 500 has been tracking our yellow projection (see chart below) – initially published in the January 13 and 24 Profit Radar Report updates – very well, and may continue to do so. 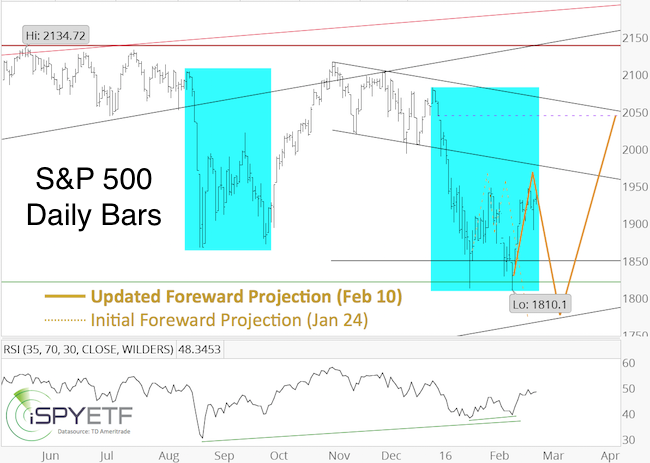 Please keep in mind that the yellow projection was adjusted via the Wednesday, February 10, Profit Radar Report to show only a marginal low followed by a less dynamic bounce. The updated projection with target levels is available to Profit Radar Report subscribers. Test drive the Profit Radar Report here. Can this Gold Rally Stick? Gold is the best performing asset of 2016, up 15% since December 3, 2015. This wasn’t the first time the financial media (or hedge funds) got it wrong. 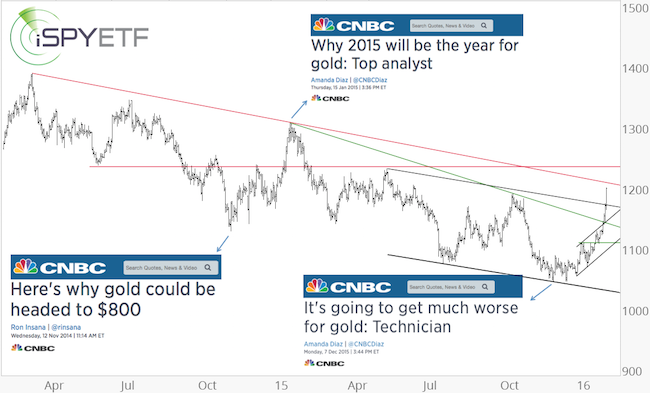 The chart below captures CNBC’s top 3 most ‘brilliant’ gold calls. 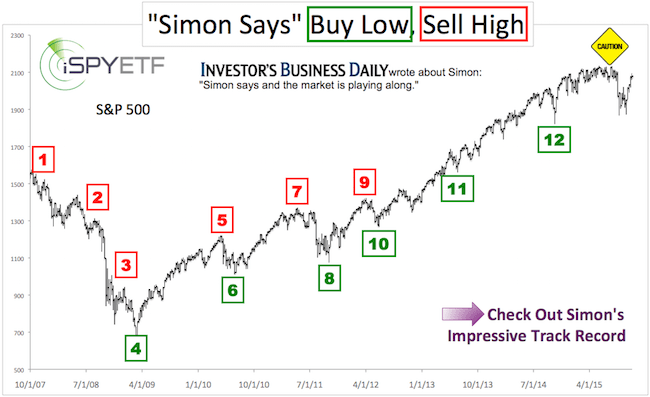 Leading up to the December low, the Profit Radar Report had been carefully watching investor sentiment developments and published the chart below in the November 30, 2015 update. Commercial hedgers’ net short exposure dropped to the lowest level in over a decade (since hedgers are by nature net short, it looks like a ‘high’ on the chart). 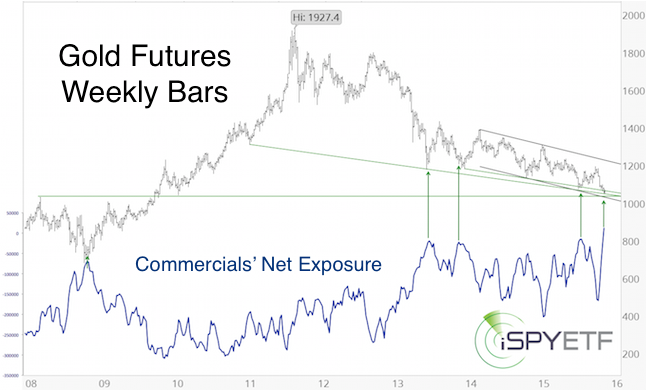 Unlike the media and hedge funds, commercial hedgers are the ‘smart money.’ It rarely pays to bet against the smart money, and the smart money was looking for higher gold prices a couple months ago. Despite being overbought, gold busted already through two resistance levels. This is long-term bullish. Short-term, gold is near the next resistance level and is trying to take a stand against a pocket of bearish seasonality. This gold rally has much more up side potential than the prior ones (which failed after 10 – 15% gains), but buying the dips appears more promising than chasing trade right now. Continuous gold analysis is available via the Profit Radar Report. 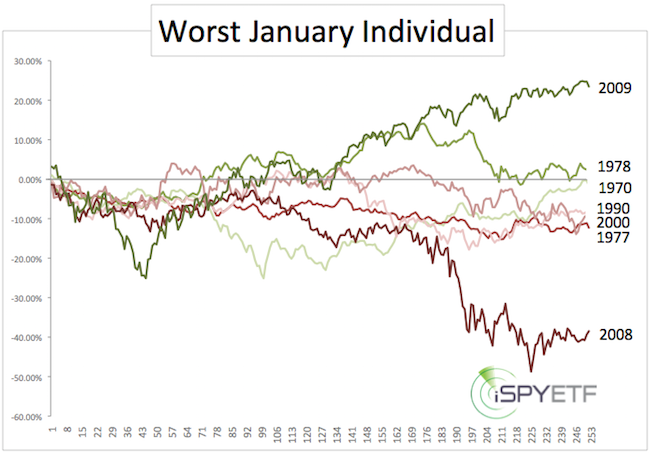 The S&P 500 ended January with a 5.07% loss. 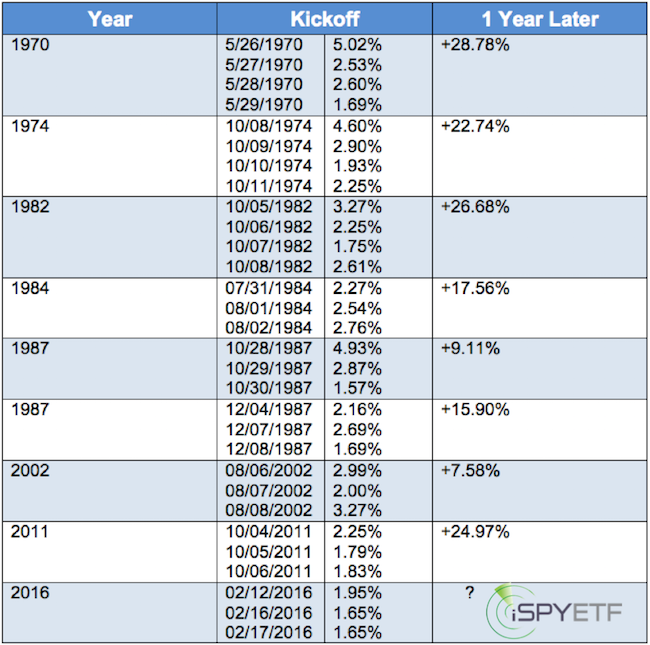 This is only the 8th time the S&P got hit with a January loss of 5% or more (since 1970). The table below shows all 5%+ January losses and the corresponding full-year performance. The chart below shows each individual year’s exact path from January – December. 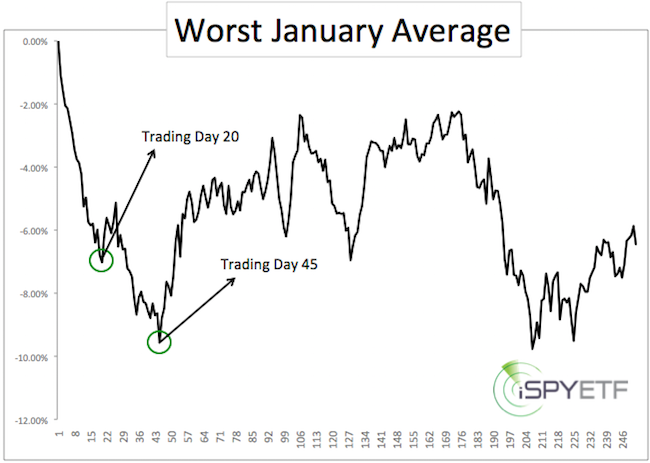 The next chart shows the average performance of the ‘worst Januaries.’ It might be worth noting that the initial low happened after 20 trading days. 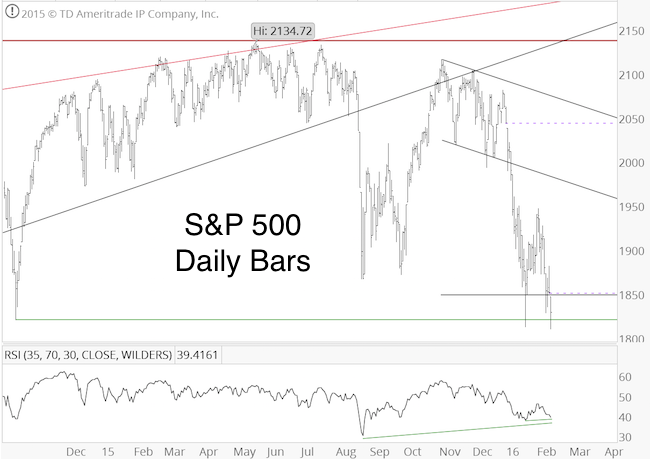 A brief bounce was followed by a more sustainable low around trading day 45. Not to fudge the numbers, but one could argue that 2008 was an outlier year. Taking 2008 out of the equation, the year-end loss shrinks from 6.4% to 1.1%. 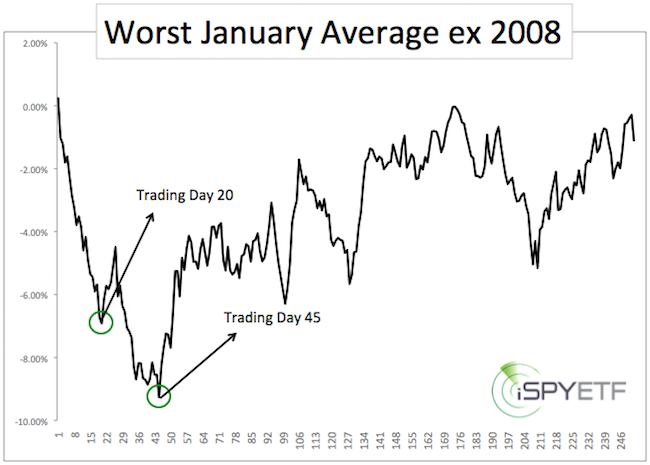 The pattern of a lower low after 45 days followed by a sizeable rally remains in tact. Patterns like this don’t come with a predictive guarantee, but they provide some insight on how traders tend to react to certain events. 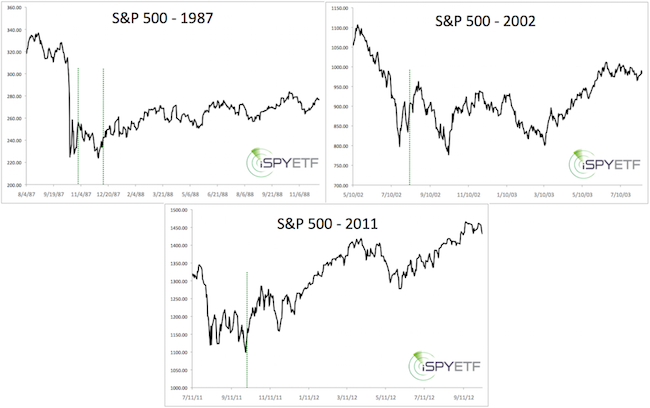 Such patterns are one of many components that go into the Profit Radar Report forecasts and trading recommendation.